Tinytag Re-Ed count input data loggers connected to a rain gauge record rainfall data as part of vital flood warning work. 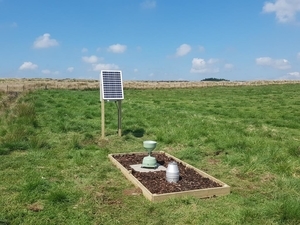 The Scottish Environment Protection Agency is using Tinytag data loggers in rainfall monitoring, to provide data which is used as part of the models within its Flood Early Warning System. This allows SEPA to inform both the public and category one responders of flooding in their area. A large number of Plus Re-Ed TGPR-1201 data loggers have been installed across SEPA's entire rain gauge network throughout Scotland. They are connected to an EML SBS500 rain gauge and are used as a standalone backup logger should the primary logger fail at site. Rainfall totals are recorded every 15 minutes. Data recorded in the Tinytag Explorer software is then rescaled in MS Excel to convert each pulse count into a 0.2mm rainfall tip. Michael Dyer is Senior Scientist for the flood warning improvements project and was made aware of Tinytags by the Project's instrumentation specialist. They were chosen for their ease of use, the ease of use of the Tinytag Explorer software, their long battery life and size - ideal for fitting inside the Tipping Bucket Rain Gauge (TBR). Michael comments, "The TGPR-1201 Tinytag data loggers have proved to be very useful - they have helped us to always maintain a full data record across our rain gauge network and proved an excellent and reliable piece of kit. They ensure we never have any gaps in our rainfall data and have proved invaluable on many occasions when there have been issues with either the primary data logger or the TBR instrument itself. They also provided information that local hydrologists use to assist with Quality Control checks on rainfall data." The image shows one of SEPA's standard rainfall sites.